Sri Lankan Minister of Resettlement and Reconstruction Mr D.M. Swaminathan, who visited Jaffna on Monday publicly admitted that his ministry was been unable to release lands and provide for resettlement of the uprooted people from Valikaamam North as it had been promised by himself earlier. The SL military has not been cooperating as required in the release of lands as promised, the powerless Colombo-based Tamil minister said passing the blame from political leaders to the occupying military establishment. The visiting UNP minister was addressing the elected representatives, civil officers and the organisations representing the uprooted Tamils from Valikaamam North at two places, in Thelliappazhai and at the Jaffna District Secretariat. 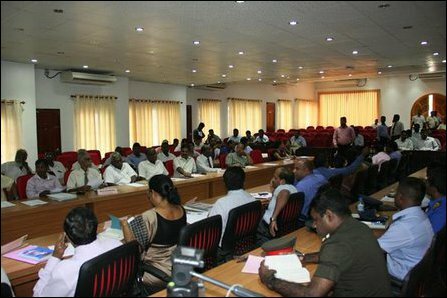 Severe criticisms were levelled against the SL Ministry of Resettlement at the meeting held at Jaffna District Secretariat. The ministry was only running PR campaigns for the Colombo regime but was very poor in administrative performance, Tamil representatives and civil officials openly stated. The resettlement ministry has failed to provide housing. The SL ministry was even not able to put up access roads to the pockets of lands that have been released so far, the civil officials said. UNP’s Jaffna-based politician Ms Vijayakala Maheswaran, who is seeking votes from Tamils in the forthcoming elections, readily blamed the inability of Swaminathan’s ministry. 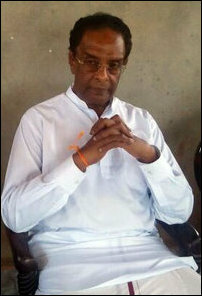 Recently, Ranil Wickramasinghe, the Prime Minister of genocidal Sri Lanka, had gone on record stating that any reduction of SL military in North and the release of former High Security Zone lands are matters to be decided by the military leadership and these were not matters to be decided by the political leadership. SL President Maithiripala Sirisena, from the SLFP, is the SL Commander-in-Chief of the three armed forces. UNP's Ruwan Wijewardene is the State Minister of Defence. Wijewardene has already ruled out any reduction of the SL military in the North. 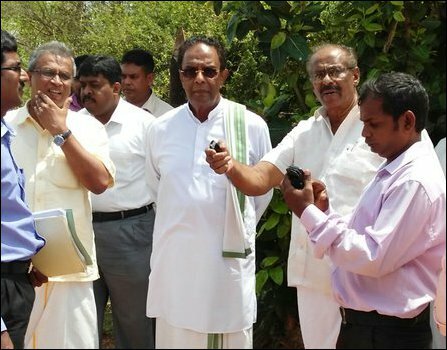 UNP's Swaminathan was forced to wait for more than 40 minutes in front of the gate of the SL Navy cantonment called ‘Command Headquarters - North Western Naval Area’ on 30 May, when he visited Mannaar to witness the plight of uprooted Tamils in Mu'l'likku'lam in Musali division. Mr Swaminathan has also been criticized for losing control of his own institutions to UPFA appointed Minister of Industry and Commerce Mr Rishad Bathiudeen, who has been notorious for causing dissension between Tamil-speaking Muslims and Tamils in the North-East. In the meantime, TNA's nominated parliamentarian M.A. Sumanthiran, who has come under severe criticism for advocating collaboration with the new regime, is now talking about taking up the issue of releasing more lands with the military commanders. 08.05.15 Swaminathan's secretary admits SL military delaying release ..
22.03.15 SL Military motives questioned while Colombo trio visits Jaf..
07.02.15 Genocidal Sri Lanka insists full continuation of military oc..